Changing up the stair railings in a home is a good way to add some pizzazz to a home. It can completely change the decor and give a home a much-needed face-lift. Stair railings can beautify a home as well as add character. One great aspect of stair railings is their versatility. Homeowners can choose from several different types of woods for their railings. They are often easy to alter with different stains or paints to suit anyone’s tastes. For example, staining a railing the same color as a floor can create consistency in décor. On the other hand, staining a contrasting color can add dimension and interest to an area that needs some personality. Whether your tastes are classic, contemporary, or somewhere in between, stair rails have a way of bringing appeal, charm and character to a home. They can be simple and utilitarian or they can be grand and awe-inspiring. There is no limit to what a stair rail can be and how it can improve the look of a home. Wood stair rails are perfect for any home since wood is a timeless material. It looks good with any decor. Also, wood railings have a way of bringing the outdoors inside by adding just a bit of nature to the home. Choose from sleek designs or ornate patterns based on the style of your home. Stair rails can help a home make the most of whatever space it has. A smaller home can still have a fabulous stairway. A simple wood stairway can still look elegant by choosing the right materials. A basic wooden railing with narrow slats can make a stairway appear larger than it actually is. Large foyers are great places for large stairways that make a statement. They can help to create or carry out a dramatic theme or they can give a home a regal feeling. Feel like royalty when you walk down the stairs in a formal outfit, holding your revamped stair railings. Stair railings can often get worn down over the course of time. The wearing usually comes from everyday use and age. Railings are often subject to dry rot, which is the decaying of the wood due to fungus. Regardless of the reason for a stair railing being worn, it is a good idea to replace or repair any part of a railing that gets too worn down to ensure railings are strong and safe to use. If someone grabs a faulty railing, they could fall and get hurt. In some instances, you might be liable to pay for their medical bills and injuries. Refinishing a stair railing can be a good DIY project for a homeowner. Popular Mechanics offers a few easy steps for refinishing a stair railing using a sanding sponge that is coated with abrasive grit. Your first step is to sand the stairway to create a smooth and even surface. Start at the top and work your way down, sanding parallel to the wood grain. Tough stains can be removed with paint thinner and steel wool. Once they look better, sponge-sand the railing a second time then apply the varnish to the smooth, sanded surface. Vacuum away any dust or debris before varnishing and wipe down the stairs with a damp cloth. Apply a light coat of polyurethane varnish to the treads, risers and rail for a consistent shade. Use a foam brush for the smoothest possible finish. It takes several hours for the stairway to dry then you can sand the surfaces with 180-grit sandpaper. Wipe away the dust, apply a second coat of polyurethane and allow it to dry before using the staircase. 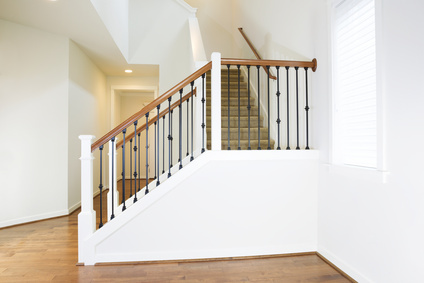 Many people hire a professional to take care of refinishing stairways and stair railings because the work can be time-consuming and challenging. Not only can stair rails enhance the inside of a home, they can improve the outside as well. Stair rails can brighten up the outdoor entryway and create a warm welcoming area for visitors. Wooden stair railings can also be used as enclosures for decks and balconies. They create separate outdoor spaces and help people walk along decks and stairs safely. People can hold onto the stair railing in wet or icy weather to help prevent falling. In certain places, you are required to have stair railings on pathways and stairways. Besides being beautiful, they are practical and help people to move along without getting hurt. Not only are wooden stair rails functional, they are aesthetically pleasing and make a good use of space. Anyone wanting to make some easy improvements to their home should think about revamping or refurnishing their stair rails. It is amazing how a little bit or work can greatly improve a space and make it safer for everyone who visits your home.